I took an unplanned detour to have The Kindness Bus worked on once again. Hopefully this third time will be a charm. It seems that no matter which direction The Kindness Bus heads, incredible things happen. I left the mechanic’s garage in the direction of 4 local schools. I came across a Senior Center that looked friendly enough, so I stopped in. Some of the staff and seniors, Cabrini, Joy, Donna, Don, Marion and Jack welcomed me with open arms. They insisted I stay for lunch and even insisted to take up a donation to support my mission. Such incredible generosity was shown. I visited 3 schools and the board of education later in the day. 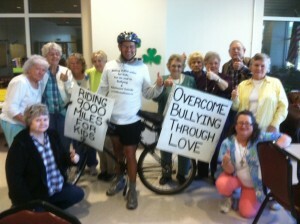 One of the school’s students cheered loudly in the distance, as I rode by with the “Overcome Bullying Through Love” sign facing them. This entry was posted on Tuesday, February 26th, 2013 at 7:35 am	and is filed under Kindness. You can follow any responses to this entry through the RSS 2.0 feed. You can leave a response, or trackback from your own site.